The 2018 Barbados Food & Rum Festival launched at Hugo's restaurant in Speightstown on Thursday August 16th. It was only fitting that this year's festival be launched on International Rum Day, heralding the celebration of the island's greatest creation and export besides Robyn Rihanna Fenty. This year's festival will be pushed forward, to run from October 18-21, 2018 as the BTMI seeks to refine and develop the nine year old festival, with a vision to have a long lasting product. CEO William Griffith, in his address at the opening of the lunch, cited that the festival was moved forward due to requests by local stakeholders, in an attempt to help them drive business in a "slightly softer period". Griffith also pointed out that, after meeting with mixologists, chefs, restauranteurs, and event promoters, the festival will in fact be a month long event, with a series of pop-ups, food truck crawls, restaurant specials and more in addition to the usual festival festivities. Barbados Tourism Marketing Inc. is promoting 2018 with the theme 'Year of Culinary Experiences', so it is fitting that the 2018 Barbados Food and Rum Festival will be focusing on local chefs and mixologists. We applaud the use of local talent which the island is full of and we hope the festival continues along this trend, giving young chefs and mixologists a chance to shine and showcase their skills. Barbados has a host of award winning chefs and mixologists and it would be remiss of the BTMI to overlook them during Barbados' second largest national festival. Michelin-star U.K. celebrity chef Tom Aikens will be the ambassador for this year's festival, a change from the numerous international chefs flown in for the festival. 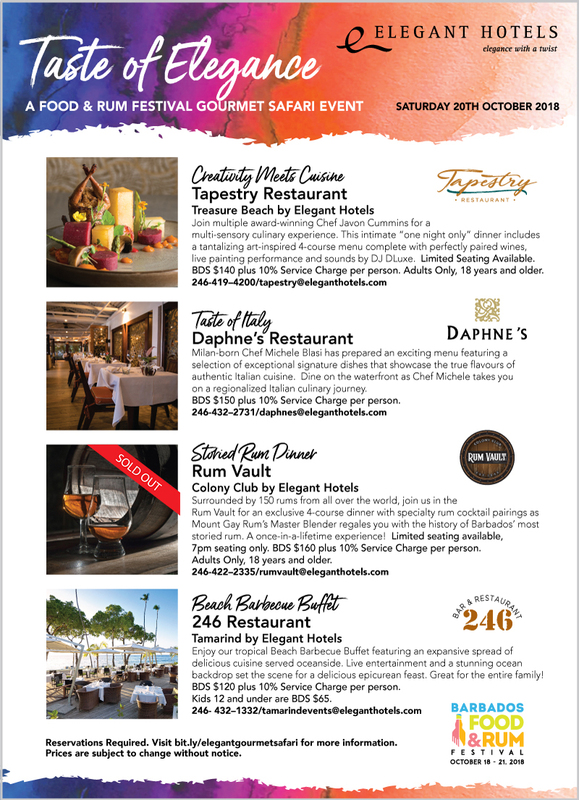 We will be delighted to see the artistry of talented Barbadian chefs featured at the festival,such as Damian Leach, Taste of the Caribbean Chef of the Year 2018, Michael Harrison, Executive Chef of Camelot Restaurant at Cobbler's Cove, Craig Greenidge, Owner and Executive Chef of CM Catering and pastry guru and multitalented chef Javon Cummins of Tapestry Restaurant, as well as other chefs and mixologists. The festival opens in the historic fishing village of Oistins, bringing the night alive with gorgeous smells and showcases by local chefs preparing fresh grilled treats. Oistins is a key tourism focal point and is seen as a signature food experience in Barbados. The event is free to the public. Friday 19th October - Taste of the Exotic, A Signature Rum Event: This all-inclusive food event moves from Concorde Experience to the West Coast, at the luxury Limegrove Lifestyle Centre. We await to see how the rear carpark will be transformed for this signature event, which was sold out last year as a mature crowd descended on Concorde Experience to enjoy a night of food and festivities, topped off with top class entertainment. Once again the Gourmet Safari features a series of dinners at locations across the island. This year, the dinner series will be focused along the West Coast at a string of Elegant Hotels properties such as Treasure Beach, Colony Club and Tamarind Hotel. Tapestry Restaurant is one notable event we are looking at, with our #30under30 honouree Chef Javon Cummins presiding over this culinary experience. The festival finishes off at the Holder's Polo Field with this all inclusive event, marrying specialty cocktails and food stations with a polo event. A far cooler ending to the festival and a change from last year's event at Hilton. Hopefully this event will be better than Hilton's festival ending last year.